Sterling silver rounded square pendant with raised edge. 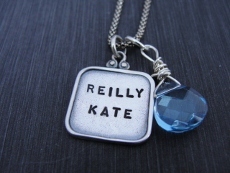 This pendant is blackened around the edges as well as the letters for an antiqued look. 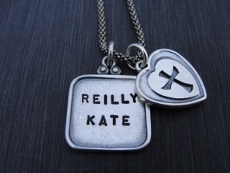 Up to four names can be stamped on the one pendant with up to eight letters for each name. The Thai bead oxidized chain comes in 16”, 18” and 20”. The pendant measures 16mm wide and 16mm tall.